However, micromanagement, in essence, is not a negative tactic. In fact, it can be both positive and effective. And perhaps no other American manager working today micromanages with greater success than the head football coach at the University of Alabama, Nick Saban. 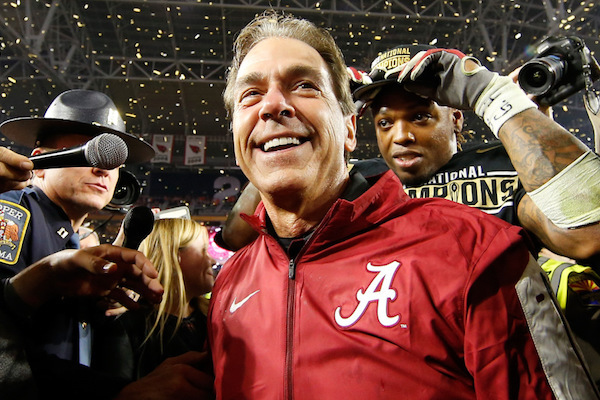 This past Monday night, Saban, who uses a micromanagement technique known as “the process,” led the Alabama Crimson Tide football team to its second NCAA national championship in a row, and its third in four years. Without a doubt, Saban’s now considered to be one of the most successful college coaches to ever pace the sidelines. Saban, in addition to his three championships with Alabama, holds a fourth from his time at Louisiana State University, and his overall record as a collegiate head coach is 159-55-1 (Wins-Losses-Ties). Currently, in Tuscaloosa, Ala., he presides over a team that annually brings in revenues of $125 million and a profit of $20 million. Along with these figures, Saban can also claim to have one of the best graduation rates in the SEC. Last year, his team set a record when 38 players took home Academic All-SEC honors. 1. Intensely focusing on each individual player, down to his in-season and off-season training schedule, study habits, and psychological state (both on and off the field). This includes defining the goals of each player and continually assessing if those goals are being met, and if they’re not being met, determining what’s being done to get closer to those goals. An example of this is Saban closely follows the workout regiment of his players (in- and off-season), and if they have goals having to do with their physical bodies, say, body fat percentage, that are not being met, he wants to know what specific steps are being taken to get leaner. 3. Closely analyzing and giving great importance to each component of each play, without focusing on the season as a whole, or the outcome of the game, or even the outcome of the play itself. Saban has said that he treats each play as if it has a life of its own, and he breaks down each play into its component parts. Like cogs in a machine, or actors in a play, the component parts are each player, and each player has a duty during each play, and Saban believes if each player focuses only on what he’s supposed to accomplish during each play—and not think of anything else, either in the future or the past, not of winning or losing, not of what the other team might be doing or not doing—and focus only on executing that duty, then that play will be a success, irrespective of its outcome. With respect to this zen-like tactic, Saban has said that he had a realization during the 1990s while coaching Michigan State, a program he turned around in three years, transforming an average, 6-6 team into a top-10 ranked team with a 9-2 record. During practice the week before Michigan State, during its average years, was to play Ohio State, which was undefeated at the time and a heavy favorite to beat Michigan State, Saban, perhaps sensing that his team was overwhelmed with the thought of playing such a formidable oppoenent, told his team not to worry about winning the game, and instead just focus on each play. In an interview with Fortune, Saban spoke about what he learned in the aftermath of his Michigan State team upsetting Ohio State that week, saying, “I'm not naive enough to think winning isn't important. But what that game made me realize is how much better it is for people not to worry about the opposition but to focus on executing and know if they do their job correctly they're going to be successful, rather than thinking the other guy's going to determine the outcome." 4. Constantly evaluating success and adding new ways to improve while never relaxing or basking in success. Over the years, Saban, in addition to using the usual core of strength coaches and motivational speakers and other instructional and practice tools implemented by many college programs, has incorporated unorthodox activities such as karate, Pilates, acting coaches, and films about other successful athletes to improve and broaden the skills of his players. Another example is recently Saban’s been interested in improving his players’ vision, and so he spearheaded the building of a special on-campus vision training facility for his team. As for success, Saban told Fortune, "When people have success, one of two things happen. They either get really satisfied and want to keep thinking about it and talking about what they did, or the success becomes a little addictive, and it makes them want to keep having more. That drive and motivation makes you understand the next challenge is that you're going to be a target, and you really need to focus on the things that helped you be successful and continue to improve. Otherwise somebody’s going to pass you up." It perhaps should also be pointed out that Saban is far from perfect. Although his meticulous micromanagement (and some would say control freakish) style allows Saban to anticipate possible scenarios as good or better than anyone to ever coach a college football team, there’s still one thing that baffles him on the field. In a post-game conference earlier this week, Saban said, “I really pride myself in being able to anticipate what’s coming next, you know, anticipate what the next problem in the organization is, anticipate what we need to solve, what we need to focus on, what we need to work on, but I’ve never been able to anticipate the Gatorade coming." That is, the ceremonial dousing of the winning team’s coach with Gatorade by his own players. *An earlier version of this post incorrectly noted that Saban "presides over" the University of Alabama football team in "Birmingham, Ala." The correct city is "Tuscaloosa."